Amy Poehler prepares for Friendsgiving with help from Google Home Hub. As you might imagine, this was a particularly funny Friendsgiving, filmed with lots of outtakes. Try “Hey Google, talk with Tasty” to get access to the entire catalog of 3,000+ recipes for all your holiday cooking needs. Rally the family and friends around the dinner table with our Broadcast feature. 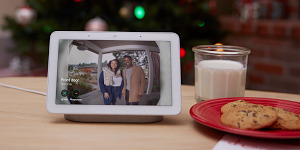 A simple “Hey Google, broadcast dinner is ready” and all the Google Home smart devices in your home will alert everyone that it’s time to eat. And when it’s all over, just say, “Hey Google, clean out my fridge” to get recipe ideas for the ingredients left in the refrigerator… perfect for leftovers. If you need a break or a little help, Google Home Hub is here with the answers. Let Amy and her friends keep you laughing, while Hub helps you with cooking.